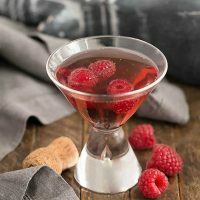 A simple, elegant cocktail made of champagne and Crème de Cassis. Taste and add simple syrup for a sweeter cocktail. Garnish if desired. *To make simple syrup, heat equal amounts of sugar and syrup in a saucepan, stirring occasionally, until sugar is dissolved. Chill and store in your refrigerator for up to 4 weeks.